It's a nature reserve, so please do not talk loudly; we're here for peace and quiet. The nature reserves, and the organisms within are protected. You cannot take a leaf home as a souvenir - the forest needs it! Do take photographs, though! When you hear the warning "jogger!" or "runners! ", keep to the left immediately, and maintain a single file until they pass - this is especially important in the narrow trails. If you see runners or joggers coming towards you, keep left and call out a warning to others likewise. Greet fellow-trail users with a cheery "Good morning" - they won't think you are nuts; it's an accepted practise in nature areas! Please keep together with others of a similar pace, especially after the first leg. 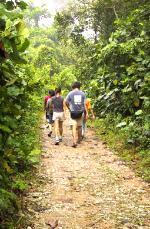 Singapore is small but you can get lost in our forests! If you experience any difficulty, please inform your guides immediately. Watch out for cyclists crossing the foot of the pipeline, just after Rifle Range Road.